arabs, biology 101, biology and behavior, biology and culture, biology matters, blat, chechens, clannishness, corruption, different peoples is different (duh! ), ed west, heh, honor, magna carta, mating patterns matter, nepotism, nepotistic altruism, relatedness matters, suicide bombings, the people's front of judea, what's this hbd business all about anyway? “Islamic State fighters claim they are not getting the chance to blow themselves up because they are being bumped down the suicide-bomber waiting list by nepotistic leaders. “A Chechen militant has complained that Saudi jihadis are favouring their own friends and family for bombing missions. “Kamil Abu Sultan ad-Daghestani said fighters were becoming increasingly angry after being left languishing on the waiting list for months. “Ironically, he said some militants were dying on the battlefield before getting the chance to carry out a bombing. “Abu Sultan’s complaint, was posted on a new website named Qonah which is said to be linked to a group connected with Akhmed Chatayev (Akhmad al-Shishani), a Chechen militant in charge of the Yarmouk Battalion of ISIS. “‘Amir [Leader] Akhmed al-Shishani told me about a young lad who went to Iraq for a suicide mission and he went there because in Sham [Syria] there is a veeeeery long queue [of several thousand people],’ he wrote. “He said the fighter eventually gave up after three months and returned to Syria, it was reported by Radio Free Europe Radio Liberty. “The young militant complained that he would only be able to secure a bombing mission through a ‘blat’ with the Saudi leaders – a Russian slang term meaning connections. “He said the only to deal with the ‘corruption’ was to make a direct appeal to ISIS leader Abu Bakr al-Baghdadi. “He recently noted on another site that Baghdadi’s own brother and the son of his second-in-command had carried out suicide bombings. see also A Boratesque story from ISIS-land: Chechen ISIS fighters being cheated out of paradise by Saudi nepotism from ed west. btw, buy ed’s latest kindle single! : 1215 and All That: A very, very short history of Magna Carta and King John (and @amazon.co.uk). 2d:4d, altruism, authoritarianism, biophobia, canada eh?, china, chinese, denisovans, domestication, eskimos, eye color, feminism, finnish content, finns, flynn effect, gene-language coevolution, general intelligence, genes and cognitive abilities, genes and height, genes and mental illness, genetic diversity, genetics and crime, greek gods, honor, inbreeding, innate differences between boys and girls, iq, kennewick man, lactase persistence, left-wing authoritarianism, life histories, morality, mtDNA, neanderthals, neo-eskimos, neolithic, ornithologists are soooo waaaaycist!, paleo-eskimos, personality goes a long way, population replacement, primates, publication bias, pygmies, race and iq, seals are people too!, social sciences, the brain, the feminist paradox, the other neanderthals, tuberculosis, twins, wabbits, walking fish, where does culture come from? The strange history of the North American Arctic – “Archaeologists mapping ancient cultures in the North American Arctic — a region spanning present-day Greenland — have long puzzled over how different cultures relate to one another. Now, an unprecedented large-scale genomics study has traced many such cultures to the Paleo-Eskimos, a people who early inhabited the harsh environment continuously for 4000 years, only to vanish mysteriously about 700 years ago. The discovery could change how scientists understand migration patterns in the North American Arctic…. After comparing the ancient and modern genetic data, the researchers found that the Saqqaq and Dorset cultures belonged to one Paleo-Eskimo people, whose genetic lineage continued in the region for more than 4000 years, from 3000 B.C.E. to 1300 C.E., contradicting previous theories that the diverse cultures came from different peoples. The Paleo-Eskimos are genetically distinct from Native Americans and Inuits, which means they represent a separate, later pulse of migration into the New World, says evolutionary geneticist Eske Willerslev of the University of Copenhagen, a co-author of the study. This contradicts previous theories that humans arrived in the Americas in three waves, painting a scenario of four waves instead — the Amerinds, the Na Dene Native Americans, the Paleo-Eskimos, and the Neo-Eskimo Thules…. What intrigues researchers most is why the Paleo-Eskimo lineage disappeared after the late Dorsets, around the same time that Neo-Eskimo Thules expanded rapidly to the Arctic. Archaeologists have found no evidence of violent conflict between the Thules and the Dorsets, but it would be hard to ignore contrasts between the two groups. The whale-hunting Thules lived in large, well-organized villages and boasted advanced technologies such as dog sleds and sinew-backed bows. The Dorsets, on the other hand, lived in small villages of 20 to 30 people and hunted with chipped stone blades. The researchers suspect that the Dorsets might have been pushed out to the fringes of the Arctic, or perhaps annihilated by a disease. ‘It’s just mind-blowing to imagine an entire people who just completely vanished,’ Willerslev says.” — see also Degüello from greg cochran. Genetic changes transformed wild rabbits into tame bunnies, DNA study reveals – “When humans domesticated wild rabbits and turned them into pet store favorites, they also changed their genome, a study has found…. The domestication of rabbits happened much more recently than that of cattle, sheep, pigs and dogs, which happened between about 15,000 and 9,000 years ago. Monks in monasteries in the south of France first domesticated northwestern europeans rabbits around 1,400 years ago…. [T]he researches report in the journal Science, small pre-existing genetic variations — sometimes just one letter of DNA code — started to become more common in the animals as they became domesticated. These variations generally didn’t affect the genes themselves, but rather acted on the genome’s regulatory regions, which are in control of whether genes are turned on or off. ‘Wild and domestic rabbits do not differ so much in actual protein sequences, but in how gene and protein expression is regulated,’ says Andersson. Among the genes particularly targeted during domestication were those involved in rabbits’ brains and nervous systems. That’s to be expected, Andersson says, because the differences between domestic and wild rabbits are almost all behavioral, while physical differences are slight…. Domestication of rabbits was made easier because the wild variety is a highly polymorphic species that already possesses many of gene variants selectively enhanced during domestication, the researchers say. That is likely to have been the case with most domesticated species, they say. ‘We predict that a similar process has occurred in other domestic animals and that we will not find a few specific genes that were critical for domestication,’ Andersson says.” — see also: Rabbit genome analysis reveals a polygenic basis for phenotypic change during domestication. Genome-wide genotype and sequence-based reconstruction of the 140,000 year history of modern human ancestry — “We investigated ancestry of 3,528 modern humans from 163 samples. We identified 19 ancestral components, with 94.4% of individuals showing mixed ancestry. After using whole genome sequences to correct for ascertainment biases in genome-wide genotype data, we dated the oldest divergence event to 140,000 years ago. We detected an Out-of-Africa migration 100,000–87,000 years ago, leading to peoples of the Americas, east and north Asia, and Oceania, followed by another migration 61,000–44,000 years ago, leading to peoples of the Caucasus, Europe, the Middle East, and south Asia. We dated eight divergence events to 33,000–20,000 years ago, coincident with the Last Glacial Maximum. We refined understanding of the ancestry of several ethno-linguistic groups, including African Americans, Ethiopians, the Kalash, Latin Americans, Mozabites, Pygmies, and Uygurs, as well as the CEU sample. Ubiquity of mixed ancestry emphasizes the importance of accounting for ancestry in history, forensics, and health.” — don’t miss figure 2! Seals May Have Carried Tuberculosis To The New World — thousand-year-old skeletons from peru suggest seals brought tuberculosis to americas. Admixture in South African Afrikaners — from razib. Holding a Mirror to Their Natures – “[U]nrelated look-alikes showed little similarity in either personality or self-esteem. By contrast, twins — especially identical twins — score similarly on both scales, suggesting that the likeness is largely because of genetics…. Personality traits do not appear to be influenced by the way people are treated because of appearance. Moreover, they found, there appears to be no special bond between look-alikes. Helen Fisher, a biological anthropologist at Rutgers University who is also an identical twin, praised that study, saying it went to the heart of what makes people form a bond. ‘Even in cases where a person is a dead ringer for another, the natural pull is not there,’ Dr. Fisher said, ‘which builds the case that there is an underlying biology to kinship. '” — h/t steve stewart williams! Genes Influence Young Children’s Human Figure Drawings and Their Association With Intelligence a Decade Later – “Do genes influence individual differences in this species-typical behavior, and is drawing related to intelligence (g) in modern children? We report on the first genetically informative study of children’s figure drawing. In a study of 7,752 pairs of twins, we found that genetic differences exert a greater influence on children’s figure drawing at age 4 than do between-family environmental differences. Figure drawing was as heritable as g at age 4 (heritability of .29 for both). Drawing scores at age 4 correlated significantly with g at age 4 (r = .33, p < .001, n = 14,050) and with g at age 14 (r = .20, p < .001, n = 4,622). The genetic correlation between drawing at age 4 and g at age 14 was .52, 95% confidence interval = [.31, .75]. Individual differences in this widespread behavior have an important genetic component and a significant genetic link with g." – h/t rosalind arden! The Canadian IQ calculated from the standardization of the WAIS IV eh? — h/t emil kirkegaard (no relation)! Differences in cognitive abilities among primates are concentrated on G: Phenotypic and phylogenetic comparisons with two meta-analytical databases – “Using meta-analytic databases of ethological observations of cognitive abilities involving 69 primate species, we found that cognitive abilities that load more strongly on a common factor (which is here termed G, in line with the terminology developed in previous literature to describe aggregated measures of general intelligence) are associated with significantly bigger interspecies differences and bigger interspecies variance. Additionally, two novel evolutionary predictions were made: more G-loaded abilities would present (1) weaker phylogenetic signals, indicating less phylogenetic conservativeness, and (2) faster rates of trait evolution, as it was hypothesized that G has been subjected to stronger selection pressures than narrower, more domain-specific abilities. These predictions were corroborated with phylogenetic comparative methods, with stronger effects among catarrhines (apes and Old World monkeys) than within the entire primate order. These data strongly suggest that G is the principal locus of selection in the macroevolution of primate intelligence. Implications for the understanding of population differences in cognitive abilities among human populations and for the theory of massive modularity applied to intelligence are discussed.” – h/t erwin schmidt! The Elusive X-Factor, or Why Jonathan Kaplan Is Wrong about Race and IQ – @humanvarieties. Coevolution of languages and genes – “[E]volutionary processes are more complex than simple models of gene-language coevolution predict, with linguistic boundaries only occasionally functioning as barriers to gene flow. More frequently, admixture takes place irrespective of linguistic differences, but with a detectable impact of contact-induced changes in the languages concerned.” – h/t jayman! Does Natural Law exist? – “While certain notions of right and wrong can apply to all humans, much of what we call ‘morality’ will always be population-dependent. What is moral in one population may not be in another.” – from peter frost. Global genetic variations predict brain response to faces – “[A] significant proportion of the brain response to facial expressions is predicted by common genetic variance in a subset of regions constituting the face network. These regions show the highest inter-individual variability in the number of connections with other network nodes, suggesting that the genetic model captures variations across the adolescent brains in co-opting these regions into the face network.” – h/t razib! The impact of neighbourhood deprivation on adolescent violent criminality and substance misuse: A longitudinal, quasi-experimental study of the total Swedish population — “We found that the adverse effect of neighbourhood deprivation on adolescent violent criminality and substance misuse in Sweden was not consistent with a causal inference.” — see also Depraved on account of being deprived? from dr. james thompson. Daughters provide as much elderly parent care as they can, sons do as little as possible — h/t frau katze! Social sciences suffer from severe publication bias – “Survey finds that ‘null results’ rarely see the light of the day.” – h/t claire lehmann! Haidt: “Political Diversity Will Improve Social Psychological Science” – from steve sailer. arab autumn, arabized world, assimilation, biology 101, biology and behavior, biology matters, blood feud, burkas and niqabs and hijabs oh my!, clannishness, clans, democracy, different peoples is different (duh! ), family honor, father's brother's daughter marriage, feuds, honor, honor killings, inbreeding, inclusive fitness, islam, it's not the state, japan, japanese, kissin' cousins, luv ya japan!, mating patterns matter, muslims, punjabis, relatedness matters, self-sealing societies, sikhs, stanley kurtz, steve sailer, tribes, what's this hbd business all about anyway? i’ve said it before and i’ll say it again: stanley kurtz is a really, really smart guy. he’s especially smart when it comes to mating patterns and family types in the middle east/arab world and how those affect the social and political workings of the nations in those regions. which is why i had a little #StanleyKurtzFest to myself on twitter the other day. (^_^) and i thought i’d repeat it here. kurtz trained as a social anthropologist (at harvard) and did his fieldwork in india, so he knows anthropology. he wrote several articles about mating patterns and things like democracy in the arabized world, some of them back before we got involved in iraq in the early 2000s, so the guy is aware. but EVERYthing he wrote back then still very much applies to iraq today, not to mention to afghanistan, syria, libya, egypt — in other words, the whole arab autumn movement. oh. one other thing that stanley — along with many others — gets wrong is the idea that people let go of their extended families if and when they have some sort of just state in charge that will take care of the rights of the individual. that is, imho, exactly backwards. states that are (more or less) of, by, and for the people only come into existence — can only come into existence — after a population has moved away from the extended family as the basic unit of society. there is evidence that this was the order of events in medieval england, and i’m betting that it will hold for elsewhere as well. more on all that another time. “In the Islamic Near East, however, the term ‘tribe’ has a fairly specific meaning. Middle Eastern tribes think of themselves as giant lineages, traced through the male line, from some eponymous ancestor. Each giant lineage divides into tribal segments, which subdivide into clans, which in turn divide into sub-clans, and so on, down to families, in which cousins may be pitted against cousins or, ultimately, brother against brother. Traditionally existing outside the police powers of the state, Middle Eastern tribes keep order through a complex balance of power between these ever fusing and segmenting ancestral groups. “The central institution of segmentary tribes is the feud. Security depends on the willingness of every adult male in a given tribal segment to take up arms in its defense. An attack on a lineage-mate must be avenged by the entire group. Likewise, any lineage member is liable to be attacked in revenge for an offense committed by one of his relatives. One result of this system of collective responsibility is that members of Middle Eastern kin groups have a strong interest in policing the behavior of their lineage-mates, since the actions of any one person directly affect the reputation and safety of the entire group. “Universal male militarization, surprise attacks on apparent innocents based on a principle of collective guilt, and the careful group monitoring and control of personal behavior are just a few implications of a system that accounts for many aspects of Middle Eastern society without requiring any explanatory recourse to Islam. The religion itself is an overlay in partial tension with, and deeply stamped by, the dynamics of tribal life…. “Looking at a political map of the Middle East, we tend to assume government control of the territories lying within all those neatly drawn borders. It is a serious mistake. As Salzman puts it, traditional Middle Eastern states are more like magnets, exerting force on territory near the center, while losing power with distance. The Ottoman Empire (and the British) ruled the tribes loosely, demanding an annual tribute but generally leaving them to govern themselves. To a remarkable extent, this holds true today. While the precise degree of centralized power ebbs and flows, tribes living in what are often quite large territories on national peripheries exist largely free of state power. “In this first in a series of essays on Muslim cousin-marriage, I want to begin to make the case that Muslim kinship structure is an unexamined key to the war on terror. While the character of Islam itself is unquestionably one of the critical forces driving our global conflict, the nature of Islamic kinship and social structure is at least as important a factor — although this latter cluster of issues has received relatively little attention in public debate. Understanding the role of Middle Eastern kinship and social structure in driving the war not only throws light on the weaknesses of arguments like D’Souza’s, it may also help us devise a new long-term strategy for victory in the war on terror. “Think of the culture of the Muslim Middle East as ‘self-sealing.’ Muslim society has a deep-lying bias toward in-group solidarity, the negative face of which manifests itself in a series of powerful mechanisms for preventing, coercing, or punishing those who would break with or undermine the in-group and its customs. This bias toward in-group solidarity serves to shelter Muslim society from interaction with the forces of modernity, and also explains why Muslim immigrants so often fail to assimilate. Of course, no society can function without some sort of ‘in-group solidarity.’ Yet the Muslim world is truly distinctive on this score. When it comes to the core principles of kinship, Muslim practices strengthen and protect the integrity and continuity of the in-group in a way that sets the Middle East apart from every other society in the world. To appreciate this fact, we’ve first got to understand some fundamental things about the nature of kinship. “For the greater part of human history, nearly every society has been organized into units based on kin ties. Modern life greatly reduces the significance of these ties, since capitalism tends to allocate jobs based on ability (instead of who your father is), while democracies apply laws, and assign benefits, on the principle of equal citizenship (not birth). By contrast, in most traditional societies, a man’s security, health, prosperity, and religious standing all depend, first and foremost, on his relatives. So to understand the kinship structure of a traditional society is to make sense of a good deal of life there. Unfortunately, our contemporary thinned-out notion of kinship has made it tough to recognize just how profoundly societies are shaped by variations in marriage practices. That’s why we’re far more comfortable making sense of the war on terror through the lens of a familiar phenomenon like religion, than in the light of something alien, like cousin marriage…. “All right, let’s say we have a society made up of clans organized by descent through the father. (Imagine a grander version of your own father’s family line, or something like the Hatfields and McCoys.) In any given clan, the men all trace their descent from a common male ancestor. In such a society, a rule or preference for cross-cousin marriage would create a systematic form of exogamy. In other words, if every man in a patrilineal, clan-based society were to marry his mother’s brother’s daughter, every man would be marrying someone from a different clan. (For example, if you were to marry your own mother’s brother’s child, you would be marrying someone from outside of your father’s family line.) Since every man’s mother in our imaginary society is born into a different patriclan than his own, when a man marries the daughter of his mother’s brother (i.e., his cross cousin) he is renewing an alliance with another patriclan (i.e. his mother’s birth clan) by bringing a woman from his mother’s birth clan into his own clan as a wife, just as his father did before him. “On the other hand, in a society made up of competing patriclans, a rule or preference for parallel-cousin marriage would have exactly the opposite effect. Parallel-cousin marriage would seal each and every clan off from all of the others. If, say, every man in a society made up of patrilineal clans was to marry his father’s brother’s daughter, every man would be married to a descendent of his own birth clan. (For example, if you were to marry your own father’s brother’s child, you would be marrying someone from within your father’s family line.) That would be a very strong form of endogamy, or “marrying in,” which, according to Tylor, would encourage social isolation, cultural stasis, rivalry, and high levels of conflict between clans…. “And as we’ve already seen, parallel-cousin marriage [i.e. fbd marriage-h.chick] has an effect precisely the opposite of the alliance-building interchange encouraged by cross-cousin marriage — and praised by Tylor and Levi-Strauss. Instead of encouraging cultural exchange, forging alliances, and mitigating tensions among competing groups, parallel-cousin marriage tends to wall off groups from one another and to encourage conflict between and among them. However strong the urge among anthropologists to identify the cooperative advantages of exogamy as a core characteristic of human nature itself, the hard fact of the matter is that a significant minority of human societies have chosen to organize themselves according to principles quite the opposite of alliance-based exogamy. Care to hazard guess as to exactly where in the world those societies might be? “[O]nce you understand how Muslims construct society as a collection of counterbalanced, sometimes allied, sometimes feuding, closed-off, and self-sufficient family cells, the problem of Muslim cultural persistence begins to make sense. Holy also allows us to appreciate that the Muslim seclusion of women (another critical barrier to modernization and assimilation) is part and parcel of a larger complex of practices, at the center of which is parallel-cousin marriage…. “With all the economic and social diversity in the Middle East, one factor remains constant. Wherever parallel-cousin marriage is practiced, the notion that the honor of the male family-line depends upon the sexual conduct of women is strong. For this reason, a woman’s father’s brother’s son (her parallel cousin) has the right-of-first-refusal in the matter of her marriage. To protect against the possibility of a woman’s shameful marriage (or other dangerous sexual conduct) damaging the honor of the men of her lineage, male relatives have the right to keep her safely within the family line by marrying her off to her parallel cousin. “The split between the state and society-at-large has a long history in the Middle East. The governments of Mohammad and his immediate successors, the ‘rightly guided Caliphs,’ were successful theocracies. But as Islam’s empire grew, the Caliphs were forced to resort to strategies of authoritarian rule and hereditary recruitment that violated strict Islamic principles of equality and consultation. The result was that the state itself lost legitimacy. Righteous Muslims grew more interested in avoiding the state than in serving it. The image of Mohammad’s just theocracy lived on, and religion was still blended with everyday social practice through the regulations of Islamic law, but for much of Islamic history, the state itself was devalued and delegitimated. “That was less of a problem before the modern era. The great Islamic empires ruled their subjects lightly taxing and offering military protection, but for the most part depending on tribal ties and kinship (along with Islamic law) to regulate the daily business of life. The rulers stayed out of the day-to-day affairs of the people, and the people liked it that way. The old system allowed Muslim governments to cobble together huge empires out of essentially self-governing populations. Yet under modern conditions, the traditional split between the self-contained world of tribe and kin, on the one hand, and the state on the other, sets up a debilitating struggle between tradition and modernity. “The meltdown in the Middle East has been fueled by massive population growth and a flood of rural immigrants into cities like Cairo and Istanbul. Governments have been hard pressed to provide the new urban immigrants with municipal services, much less jobs. That’s where those kin networks come in. In European history, even in rural areas, extended kinship ties grew progressively less important, until the collapse of feudalism and the rise of cities created a society of truly modern individuals. The new European society was ruled by powerful centralized governments, and bureaucracies that applied the law equally to all. But unlike the urban masses of Europe, the rural migrants powering the Middle East’s urban population explosion have brought their traditional kinship networks with them. Those networks offer support to the common man where weak Middle Eastern governments cannot — while also making it impossible for a modern political and economic system to take root. Family connections get you food when neither government nor the economy can provide it. But the corruption fueled by the family ethos sabotages the government’s distribution plans, undercuts the government’s legitimacy, and blocks the path to societal liberalization…. “The conflict between modernity and the traditional Muslim view of women is one of the most important causes of this war. The tiresome claim of the leftist academy that poverty causes terrorism misses the point. So far from being poor, Muslim fundamentalists tend to come from a relatively wealthy modernizing class. The terrorists and their supporters are generally newly urbanized, college-educated professionals from intact families with rural backgrounds. They are a rising but frustrated cohort, shut out of power by a more entrenched and Westernized elite. True, the new fundamentalists often find themselves stymied by the weak economies of Muslim countries, but as a class they are relatively well off. Like many revolutions, the Muslim fundamentalist movement has been spurred by increased income, education, and expectations. But it is the clash between traditional Middle Eastern family life and modernity that has decisively pushed so many toward fundamentalism. And women are at the center of the problem…. “The Taliban’s code of womanly behavior was intentionally directed toward the cities. The aim was to ‘purify’ those areas of Afghanistan that had been ‘corrupted’ by modernization. But the Taliban never bothered to enforce its rules in traditional areas. Actually, in most Afghan villages, women rarely wear the burka. That’s because villages in Afghanistan are organized into kin-oriented areas, and the veil needs wearing only when a woman is among men from outside of her kin group. A rural woman puts on a burka for travel, especially to cities. Yet just by exiting her home, a woman in a modern city inevitably mixes with men who are not her kin. That’s why the Taliban prohibited the modernized women of Kabul from so much as stepping onto the street without a male relative. So the real problem with the veil in Afghanistan was the Taliban’s attempt to impose the traditional system of veiling on a modernizing city. Yet, remarkable as it may seem, many modernizing urban women throughout the Middle East have freely accepted at least a portion of the Taliban’s reasoning. These educated women have actually taken up the veil — and along with it, Muslim fundamentalism. To see why, it is necessary to understand what makes traditional Muslim women veil in the first place. “Life in the Muslim Middle East has long revolved around family and tribe. In fact, that’s what a tribe is — your family in its most extended form. For much of Middle Eastern history, tribal networks of kin functioned as governments in miniature. In the absence of state power, it was the kin group that protected an individual from attack, secured his wealth, and performed a thousand other functions. No one could flourish whose kin group was not strong, respected, and unified. “In the modern Middle East, networks of kin are still the foundation of wealth, security, and personal happiness. That, in a sense, is the problem. As we’ve seen in Afghanistan, loyalty to kin and tribe cuts against the authority of the state. And the corrupt dictatorships that rule much of the Muslim Middle East often function themselves more like self-interested kin groups than as rulers who take the interests of the nation as a whole as their own. That, in turn, gives the populace little reason to turn from the proven support of kin and tribe, and trust instead in the state. “So from earliest youth, a Middle Eastern Muslim learns that his welfare and happiness are bound up in the strength and reputation of his family. If, for example, a child shows a special aptitude in school, his siblings might willingly sacrifice their personal chances for advancement simply to support his education. Yet once that child becomes a professional, his income will help to support his siblings, while his prestige will enhance their marriage prospects. “The ‘family’ to which a Muslim Middle Easterner is loyal, however, is not like our family. It is a ‘patrilineage’ — a group of brothers and other male relatives, descended from a line of men that can ultimately be traced back to the founder of a particular tribe. Traditionally, lineage brothers will live near one another and will share the family’s property. This willingness of a ‘band of brothers’ to pool their labor and wealth is the key to the strength of the lineage. “But the centrality of men to the Muslim kinship system sets up a problem. The women who marry into a lineage pose a serious threat to the unity of the band of brothers. If a husband’s tie to his wife should become more important than his solidarity with his brothers, the couple might take their share of the property and leave the larger group, thus weakening the strength of the lineage. “There is a solution to this problem, however — a solution that marks out the kinship system of the Muslim Middle East as unique in the world. In the Middle East, the preferred form of marriage is between a man and his cousin (his father’s brother’s daughter). Cousin marriage solves the problem of lineage solidarity. If, instead of marrying a woman from a strange lineage, a man marries his cousin, then his wife will not be an alien, but a trusted member of his own kin group. Not only will this reduce a man’s likelihood of being pulled away from his brothers by his wife, a woman of the lineage is less likely to be divorced by her husband, and more likely to be protected by her own extended kin in case of a rupture in the marriage. Somewhere around a third of all marriages in the Muslim Middle East are between members of the same lineage, and in some places the figure can reach as high as 80 percent. It is this system of ‘patrilateral parallel cousin marriage’ [fbd marriage-h.chick] that explains the persistence of veiling, even in the face of modernity. “[I]f we do decide to try to impose democracy on Iraq, it will be far harder than proponents of democratization recognize. It will entail long, unremitting U.S. effort…. “The democratizers’ model for transforming Iraq is America’s post–World War II occupation of Japan…. “Efforts to democratize a country require more than modern liberal ideas; they require a class of people who embrace those ideas and make them effective. Had a sophisticated modern bureaucratic class not been on hand to accept and implement democratic reforms, the American occupation of Japan would not have succeeded. To be sure, excessive bureaucracy can suffocate democratic liberty, but modern bureaucracies are generally democratizing forces. They embody intrinsically modern, democratic ideas — that the government office is distinct from the individual who holds it, for example, and that rules apply to all with equal force. They blow apart traditional social relations — relations that are often powerful barriers to democratic reform—by centralizing authority and power in a national government. “Japan’s relatively modern bureaucratic class was in place even before the Meiji Restoration. Many former samurai, displaced by history from their traditional military role, had moved into administrative positions. No egalitarians, these men possessed a profound sense of superiority and entitlement, based on a conviction that they had transcended the petty selfishness of the ordinary man to devote themselves to a higher good. In the administrative realm, their elite spirit of nobility and sacrifice took the form of an ethic of detachment, incorruptibility, and public-spiritedness — ideal virtues for modern bureaucratic elites. Once Meiji Japan began to copy Western bureaucratic and meritocratic models, the samurai, with their background in government service, fit right in and helped make those models work in their new Japanese setting, especially since these men had come under the influence of the liberty and popular-rights movement, whose leaders were displaced samurai like themselves. “The distinctive samurai ethic of public service put an enduring stamp on the Japanese democracy that emerged from the American occupation. To this day, many scholars describe Japan as a ‘bureaucratic polity,’ with government bureaucrats running the country, the political parties, and the industries too. “Nothing comparable to Japan’s liberal intellectual tradition and modern, public-spirited bureaucratic class exists in Iraq or in any Arab country. The influence of fundamentalist Islam in the Arab world reflects a culture deeply inhospitable to democratic and liberal principles. In a perceptive recent National Interest article, Adam Garfinkle explains that, whereas democracies take as bedrock assumptions that political authority lies with society, that the majority rules, and that citizens are equal before the law, Arab societies vest political authority in the Qur’an, rest decision-making on consensus, and understand law and authority as essentially hierarchical. They lack such essential cultural preconditions for democracy as the idea of a loyal opposition or the rule of law or the separation of church and state. No surprise, given their nonmodern political beliefs, that not one Arab Muslim country qualifies as ‘free’ in Freedom House’s annual survey, and that a disproportionate number of Arab regimes qualify in the ‘worst of the worst’ category — the least free and least democratic on earth. “Arab Muslim societies remain un-modern and un-democratic not just in their attitudes toward political authority and law but also in their social organization. For men and women living within a universe where tribal identity, the duties and benefits of extended kinship networks, and conceptions of collective honor organize the relations of everyday life, democratic principles will be incomprehensible. “It’s a commonplace that Muslim immigrants in Europe have been slow to assimilate. In a general way, the public attributes this relative isolation to Muslim religion and culture. But if you’re looking for a clear, powerful, and detailed account of exactly what it is that’s been blocking Muslim assimilation in Europe, there is no better place to begin than Ballard. “In family life, Punjabis of whatever religion organize themselves into patrilineal descent groups. Within those patrilineal clans, a ‘joint family’ forms around a man, his married sons, and their children, with women leaving their natal homes to move in with their husbands. The family lives communally, sharing wealth and property, with grown sons under their father’s authority, and in-marrying wives working under the direction of their mother-in-law. And whether Muslim, Hindu, or Sikh, the modesty of women in dress and behavior is a key cultural value for all Punjabis. “Despite these many similarities, the position of Punjabi Muslim, Sikh, and Hindu immigrants in Britain dramatically differs. Ballard focuses his comparison on two immigrant groups: Punjabi Muslims from the Mirpur region of Pakistan and Punjabi Sikhs from the Jullundur region of India. (Ballard frequently invokes Punjabi Hindus for comparative purposes as well.) Far from being obscure or isolated examples, it turns out that nearly three-quarters of British Punjabis are either Mirpuri Muslims or (largely Sikh) Jullunduris. With Punjabis making up the great majority of all British South Asians, Ballard’s careful comparison is therefore telling us about two of the largest and most influential South Asian immigrant groups in Britain. “So what’s the difference between Jullunduri Sikhs and Mirpuri Muslims? Quite simply, Jullunduri Sikh’s have moved relatively far down the road of assimilation, while Mirpuri Muslims have not. Now largely middle class, many British Sikhs have abandoned manual labor to start their own businesses, have moved from the inner city to the suburbs, and currently see their children performing academically at the same level as other middle-class Britons. British Mirpuri Muslims, on the other hand, move between unemployment and manual labor, are still largely confined to poor, inner-city ethnic enclaves, and rear children with a limited grasp of English and a notably low level of academic achievement. “Given the broad social, cultural, and linguistic similarities between Mirpuri Muslims and Jullunduri Sikhs (and Hindus), how are we to account for the radically different trajectories of these immigrant communities in Britain? Can religion explain the difference? In a sense, it can. Yet the key barriers to assimilation aren’t always religious in the strict sense. The factors that inhibit assimilation have less to do with Muslim beliefs per se than with the distinctive, non-textual practices that organize Muslim society. “In particular, the practice of cousin marriage has served to create a culturally insulated community of Mirpuri Muslims in Britain…. “The practice of cousin marriage among Pakistani immigrants has significantly slowed Muslim assimilation in Britain. Muslim cousin marriage has also facilitated a process of ‘reverse colonization,’ in which large, culturally intact sections of Pakistani Muslim society have been effectively transferred to British soil. These conclusions emerge from the work of British South Asianist Roger Ballard — particularly from his path-breaking paper ‘Migration and kinship: the differential effects of marriage rules on the processes of Punjabi migration to Britain.’ In the first part of ‘Assimilation Studies,’ I laid out the background necessary to follow Ballard’s case. Here in Part II, I’ll run through the core of his argument. I’ll also explain why highlighting the significance of Muslim cousin marriage is such a difficult and controversial enterprise…. “What differences did Ballard find between the two big groups of British immigrants from the Punjab: Muslims from the Mirpur district of Pakistan, and Sikhs from the Jullundur district of India? Although both of these groups share a broadly similar social and cultural background, their patterns of assimilation have been strikingly different…. “Even in the 1970s, when Mirpuri Muslim laborers finally did begin to bring their wives and children to live with them in Britain, ties to Pakistan were sustained through ‘chain migration.’ With immigration regulations in Britain reflecting a lesser need and desire for foreign workers, villagers back in Mirpur could obtain visas only by marrying Mirpuri migrants already in Britain. Children of these couples, in turn, married and brought to England yet another generation of Mirpuri villagers, with each link in the chain of marriage migration insuring that the process of adjustment to English language and culture would begin again from scratch. These relatively unassimilated Mirpuri marriage-migrants were largely confined to the inner-city — to neighborhoods that recreated, insofar as possible, the linguistic and cultural conditions of Pakistan itself. Given their limited contact with English-speaking neighbors, Mirpuri children in these ethnic ghettos continued to have problems in school. “As Muslim and Sikh immigrants gradually adjusted to life in Britain, it became increasingly evident that marriages arranged with villagers from back home tended to be riven with conflict. Cultural differences, the language gap, and the wide divergence in general social competence between British-raised youth and their spouses from South Asia frequently made for trouble and strife. So when the parents of British-born Sikhs were faced with the offer of an arranged marriage with a villager from Punjab, their children invariably opposed the match. In doing so, these young Sikhs had the advantage of knowing that their parents were under no obligation to accept any particular proposal of marriage. Given the Sikh practice of clan exogamy, every marriage is arranged from scratch with an outsider. In short order, therefore, the new generation of British-born Sikhs successfully pressed their parents to arrange marriages with British-born (or perhaps even North American-born) Sikh partners. “The situation was very different for children of Mirpuri Muslims. Among Mirpuris, it’s taken for granted that cousins have a virtual right-of-first-refusal in the matter of marriage. Even in the absence of immigration, it would have been entirely expected that the children of Mirpuri migrants would marry their cousins. How much more so was this the case when a marriage meant a British visa, and a vast increase in wealth — all redounding to the honor of the patriclan? Many Mirpuri migrants had only made it to Britain in the first place with economic help from a brother back in Pakistan. This practice of sharing of resources within the joint family created a powerful moral obligation to repay that financial help by arranging a marriage (and a visa) for the child of the brother who remained in Pakistan. “The British-born children of these Mirpuri Muslim migrants were perhaps a bit less apprehensive than their British Sikh counterparts about the idea of marrying villagers from back home. After all, these young Mirpuris had gotten to know their cousins on those long visits to Pakistan, and some affectionate attachments had developed. Yet the chronic problems of transnational marriages did indeed call forth opposition to such matches from many young Mirpuris. In contrast to the situation among immigrant Sikhs, however, the hands of Mirpuri parents were largely tied. To refuse a marriage with a relative back in Pakistan, when customary rights, financial obligation, and family honor were all at stake, would have been tantamount to a repudiation of siblingship itself. Such a severing of ties could bring retaliation in the form of efforts to blacken the honor of an immigrant and his family — a particularly severe sanction among Muslims. arabs, biology 101, biology and behavior, biology matters, blood feud, clannishness, clans, different peoples is different (duh! ), doonesbury, family honor, feuds, honor, iraq, iraqis, lack of understanding, mating patterns matter, middle easterners, misunderstandings, relatedness matters, the middle east, vengeance, what is the MATTER with you people?, what's this hbd business all about anyway? associations, biology 101, biology and behavior, biology matters, blood feud, carolingians, clan clubhouses, communes, different peoples is different (duh! ), europe, europeans, family honor, feuds, france, french people, gauls, general theory of the west, honor, i typed all that in one breath!, kindreds, kingdom of france, kinship, lineages, mating patterns matter, medieval europe, medieval france, merovingians, outbreeding, relatedness matters, so that was a really long post, the capetians, the franks, the outbreeding project, the salian franks, the state, tl;dr, upside-down-and-backwards, vive la commune!, voluntary associations, we've always been at war with austrasia, what's this hbd business all about anyway? when it comes to clan-based societies vs. nation-states and all that, the reigning paradigm is that peoples resort to relying on their extended families/clans/tribes for all sorts of things like justice and economic support in the absence of a (strong?) state, but if they somehow miraculously acquire a state, people quickly drop the connections with their extended families. this to me seems completely upside-down-and-backwards. never mind, for instance, that there have been strong states in the middle east since…*ahem*…the days of hammurabi if not before, and yet for some reason middle easterners are amongst the most clannish peoples on the planet (see: syria) — and i mean clannish as in actually relying on their clans in their daily lives. and never mind that the chinese — especially the southern chinese — still organize themselves along clan lines, too, with their clan clubhouses and everything — even though they’ve had really strong and powerful states for millennia as well. what appears to be the case, rather, is that, for whatever (*cough*genetic*cough*) reasons, people stop relying on their extended families/clans when they stop being very closely related to those family members, i.e. after a long period of outbreeding (avoiding cousin or other forms of close marriage). i’ve already shown in a previous post that the importance of the clan/kindred in anglo-saxon england was waning in the early 900s (in southern england anyway), before england was unified, so before there was a nice, cozy state for people to fall back on. the same appears to be true of the medieval french (at least some of them — there are regional differences, as there are in britain). but i’m getting ahead of myself. first things first: picking up where we left off at the end of the last post on medieval france — mating patterns of the medieval franks. let’s look at the importance of the kindred and feuding amongst the franks. then i’ll get to how and when the franks/french dropped all the kindred and feuding business. 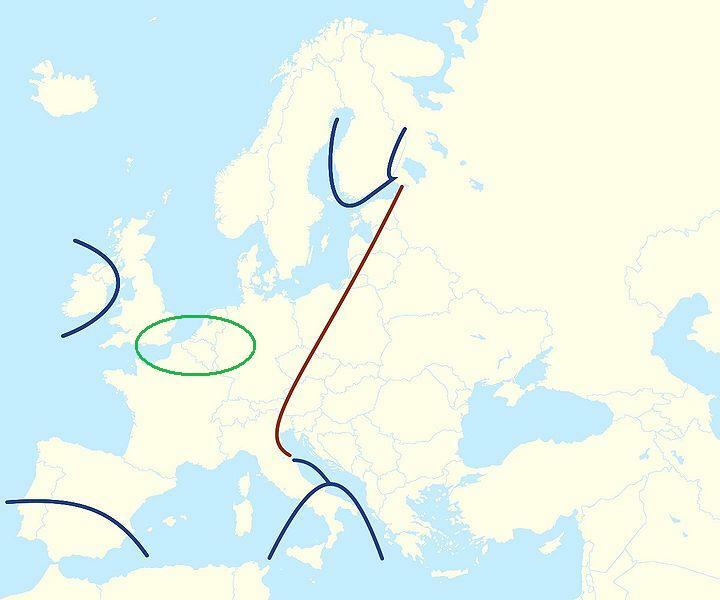 as we saw in the previous post, the franks — and really i mean the salian franks who gave rise to the merovingian dynasty in austrasia — like all the other pre-christian germanic groups (and the pre-christian irish and britons and scots, too) married their cousins. who knows how much, but enough that the various christian missionaries to these groups raised loud and very vocal objections to their marriage practices. “The kin group was important because the individual alone, or even with his immediate family, was in a precarious position in Frankish society. One needed the support of a wider kin to help him bring offenders against his peace before the courts, and one needed kin to help provide the oathhelpers that a man might be required to present in order to make his case or to establish his own innocence before the court. These roles of the kin are familiar to all the Germans. But the Frankish kin group had further responsibilities and privileges. For example, if a man were killed, his own children collected only half of the composition due, the remaining half being equally divided between those members of his kin group who came from his father’s side and those who came from his mother’s side (LXII, i)…. “The right of the kin group to share in the receipt of composition involved also the responsibility for helping members of the group to pay composition. If a man by himself did not have sufficient property to pay the entire composition assessed against him, he could seek help from his closest kin, father and mother first, then brothers and sisters. If sufficient help was still not forthcoming, more distant members of the maternal and paternal kin (up to the sixth degree, i.e., second cousins [XLIV, 11-12]), could be asked to help. This responsibility of the kin to aid their kinsmen is known in Frankish law as *chrenecruda* (LVIII)…. “The other form of protection provided by the kindred concerns blood-vengeance and the prosecution of a feud, for these act as a disincentive to violence and therefore offer protection in advance. It is not enough to define a feud as a state of hostility between kindreds; we must extend it to the threat of such hostility, but also, if the mere threat fails to prevent the outbreak of actual hostility, to a settlement on terms acceptable to both parties by means of an established procedure. In other words, the feud is a means of settling disputes between kindreds through violence or negotiation or both…. today the french are (mostly) not a clannish, feuding, kindred-based society — especially compared to, say, the arabs. what happened? when did they quit being clannish? “It was in vain that orders were given for all who refused to abandon private feuds and to settle their quarrels in a court of law to be sent to the king’s palace, where they might expect to be punished by banishment to another part of the kingdom. Not even the general oath of fealty imposed by Charles contained a general prohibition of feuds. Instead the government contented itself with prohibiting the carrying of arms ‘within the fatherland’, and with setting up courts of arbitration with the possibility of appeal to the tribunal of the palace. But as far as the prohibition of carrying arms was concerned, not even the clergy were inclined to obey it. The lesser vassals who were themselves hardly in a position to conduct a feud, could always induce their lords to interfere in their quarrels by invoking their right to protection…. But not even the most primitive form of private warfare, the blood feud, actually died out. On the contrary, it appears to have flourished especially among the lesser nobility and the stewards of large domains…. “Just as a lord could force a serf against his will to become a secular priest, so also he could force him to take the tonsure of a monk…. “Direct opposition to the blood feud began to make itself felt in southern France toward the end of the century. Combining ideology with expediency, the horror of blood with a desire for clerical immunity from attack, the Council of Charroux (989) ratified a special treaty of protection. Under God’s Peace, or the *paix de Dieu*, acts of violence against church property, laborers, peasants, their livestock, and clerics were forbidden under pain of official sanction. The Peace of Charroux took the form of voluntary submission rather than true prohibition and was sponsored by local prelates with the cooperation of the local nobility. It must have been at least partially successful, for similar accords were adopted by the Council of Narbonne in 990 and that of Anse in 994. An agreement concluded at the Synod of Puy (990) extended the protection of God’s Peace to merchants, mills, vineyards, and men on their way to or home from church. Pacts of ‘justice and peace’ were signed in 997 by the Bishops of Limoges, the Abbot of Saint-Martial, and the Bishop and Duke of Acuitaine. It was decided at the Council of Poitiers in 1000 that all infractions pertaining to *res invasae* would henceforth be settled by trial rather than war. “Monarchy favored the ecclesiastical peace movement. It appears likely, even, that Robert the Pious attempted to promulgate a declared peace at Orleans in 1010, although he remained unable to enforce it. By the third decade of the eleventh century the spirit of the southern pacts had spread to Burgundy and the North. At the Council of Verdun-le-Doubs (1016) the lay aristocracy of the region promised, in the presence of the archbishops of Lyon and Besancon: (1) not to violate the peace of sanctuaries; (2) not to enter forcefully the *atrium* of any church except to apprehend violaters of the peace; (3) not to attack unarmed clerics, monks, or their men; (4) not to appropriate their goods except to compensate for legitimate wrong inflicted. The Council of Soissons adopted an identical formula in 1023, as did the Councils of Anse in 1025, Poitiers in 1026, Charroux in 1028, and Limoges in 1031. Elsewhere, the bishops elicited individual promises of nonviolence from members of a particular diocese. At the request of the Abbot of Cluny and in the presence of the archbishop and the high clergy of the region of Macon, numerous Burgundian nobles swore in 1153 to refrain from attacking church property, to resist those who did, and to besiege the castles to which they withdrew if necessary. “A variation of the *paix de Dieu* was concluded by the bishops of Soissons and Beauvais. The *pactum sive treuga*, or *treve de Dieu*, forbade violence not according to the object of attack, but according to its time, season or day. Wars of vengeance were initially prohibited during the seasons of Easter, Toussaint, and Ascension. In addition to their oath governing sacred property and clerics, the subscribers of the Council of Verdun-le-Doubs swore: (1) not to participate during certain periods of the year in any military expedition other than that of the king, local prelate, or count; (2) to abstain for the duration of authorized wars from pillaging and violating the peace of churches; (3) not to attack unarmed knights during Lent. The Council of Toulouse added certain saints’ feast days to the list of proscribed dates; the bishops of Vienne and Besancon included Christmas and the Lenten season. Caronlingian interdiction of the blood feud on Sundays was revived by the Synod of Roussillon in 1027. From Sunday it was gradually extended to include almost the entire week: first from Friday at vespers to Monday morning and then from Wednesday sundown to Monday…. “The seigneurial peace movement in the large northern feudatory states, themselves large enough to be governed as small kingdoms, prefigured any sustained monarchic attempt to control private war. An accord ratified in Flanders at the Council of Therouanne (1042-3) regulated the right of the Flemish aristocracy to bear arms; the count alone could make war during periods of prescribed abstinence. Angevine Normandy, inspired by the Flemish example, was sufficiently advanced administratively and judiciallys to serve as a model for Philippe-Auguste after royal annexation of the duchy in the early thirteenth century. The *treve de Dieu* signed in Caen in 1047 had validated the principle of ducal regulation of private campaigns. According to an inquest conducted in 1091 by Robert Curthose and William Rufus, William I had enacted, as early as 1075, a *paix de Duc* limiting blood feuds and placing numerous restrictions upon the conduct of any but his own expeditions. The *Donsuetudines et Iusticie* of the Conqueror prohibited seeking one’s enemy with hauberk, standard, and sounding horn; it forbade the taking of captive and the expropriation of arms, horses, or property in the course of a feud. Burning, plunder, and wasting of fields were forbidden in disputes involving the right of seisin. Assault and ambush were outlawed in the duke’s forest; and, except for the capture of an offender in *flagrante delicto*, no one was to be condemned to loss of life or limb without due process in a ducal court. William’s law thus reflects a double current in the control of wars of vendetta. On the one hand, it limits the methods of private campaigns without prohibiting them altogether. On the other, it reserves jurisdiction over certain cases of serious infraction for the duke’s own court, thus bypassing the local seigneurial judge who would ordinarily have enjoyed exclusive cognizance over the crimes committed within his fief…. “Although unable to control the *faida* [blood feud – h.chick] with any certainty until well into the thirteenth century, the Crown did support a number of measures restricting the right to war. According to Beaumanoir, only noblemen can legally settle a dispute through recourse to arms; a conflict between a nobleman and a bourgeois or a peasant was to be resolved in public court. Brothers and even stepbrothers were prohibited from fighting each other. Furthermore, the Bailiff of Clermont carefully defines the limits of family obligation in pursuit of blood feuds. Duty to one’s kin-group had formerly extended to the seventh degree. Beaunamoir maintains that since the Church had set impediments to marriage only at the fourth degree, kinsmen of more remote paternity were not obliged to come to the aid of distant relatives. Thus, while the collective responsibility of the feudal *comitatus* had not been eliminated entirely, it was curtailed somewhat. “‘He who wishes to initiate war against another by declaration, must not do so ambiguously or covertly, but so clearly and so openly that he to whom the declaration is spoken or sent may know that he should be on his guard; and he who proceeds otherwise, commits treason.’ (Beaumanoir 2: 1675: 358). so despite ALL of those efforts from the authorities in medieval france over the course of three or four hundred years, kindred-based blood feuds continued in france until the 1200-1300s. meanwhile, in southern england (but NOT in northern england, wales, or the highlands of scotland), feuding seems to have died a natural death by the 1100s. it would be interesting to know if there were regional differences in the timing of the cessation of feuding in france (like in britain) — my bet is yes, but i don’t have any info on that one way or the other. i will certainly be keeping an eye out for it. there are some hints, though, that the kindred was, in fact, becoming less important in medieval france before the 1200-1300s. the first was the increasing significance of the paternal lineage (la lignée) at the (both literal and figurative) expense of the extended family. the nuclear family became more important, and parents (fathers) began to bequeath their wealth and property to their sons (and daughters) — mainly to the eldest son, of course — rather than also to their own brothers and cousins and second cousins thrice removed (you get the idea). as i wrote about in a previous post, this process of the shrinking and verticalization of the french family began around ca. 1000. most of the historical data we have on this process comes from the northern/austrasia region of the franks — where The Outbreeding Project began — but that doesn’t rule out that it wasn’t also happening elsewhere in france. again, i’ll have to keep my eye out for more info. “Communes were sworn associations of rural or urban dwellers designed to provide collective protection from seigneurial authority. The earliest development of self-governing cities occurred in the later 11th century between the Loire and the Rhineland, as well as in northern Italy…. The urban territory became officially a ‘peace zone.’ Responsibility for enforcing order and judging violators fell to the commune, as did collection of taxes and the payment of dues to the king or local lord. These urban franchises were available to all residents, including those who, fleeing servitude in the countryside, remained for a year and a day…. “Communes engaged all inhabitants in a communal oath, thus substituting a horizontal and egalitarian form of association for the more traditional ones of the aristocracy. 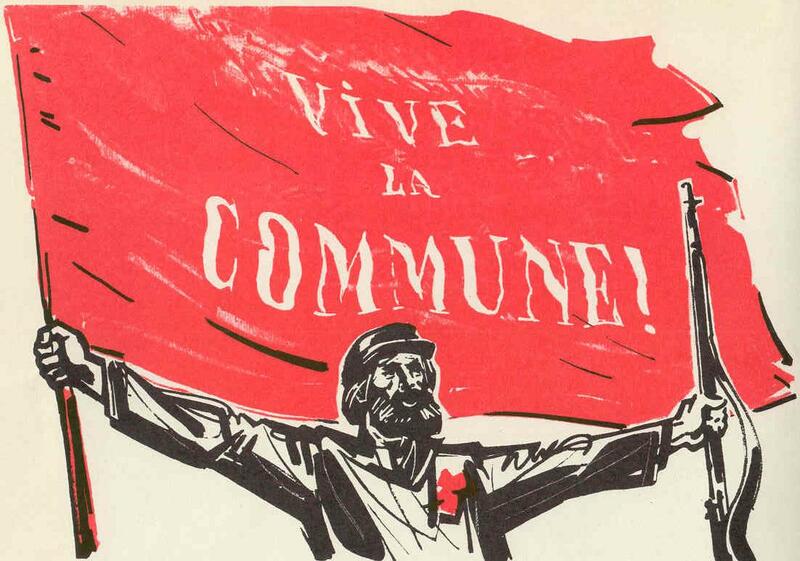 Within the commune, each member was subservient to the other as a brother. On the ideological level, the notion of ‘peace’ played so fundamental a role that in some charters *pax* and *communa* are synonymous terms…. the communes of the 1000-1100s, then, are free associations of independent individuals, usually minus their extended families/kindreds, but plus lots of civic behavioral patterns like the presence of the right to a trial in a court of law rather than the vendettas and feuds of a clan-based society. that’s a big change. wrt timing, the french communes — as free associations of independent individuals in place of kindreds — appear right around the same time as the gegildan in southern england (900s), the gegildan being another type of association of independent individuals replacing the earlier kindreds. again, i’d love to know if there were any regional differences in where these communes were located (apart from between the loire and rhine) — more in the north? more in the south? i shall endeavor to find out. to sum up, then — the pre-christian franks, like all the other pre-christian germanics, were a cousin-marrying, kindred-based population in which the extended-family was extremely important (on top of the nuclear family) and in which blood feuds between kindreds regularly occurred. a frankish individual’s identity was all bound up with that of his kindred — frankish society was not comprised of independently acting individuals. feuding also took place amongst the romano-gauls, so they were likely clannish, too. the roman catholic church banned cousin marriage in 506, but it’s likely that the franks didn’t take this seriously until after the mid-700s (although the particularly devout may have), at which point they really did (see previous post). beginning in the 1000s, there are indications — the rise of lineages and the appearance of communes — that the french kindreds were starting to break apart. however, feuding continued in france into the 1200-1300s, so clannishness did not disappear in france overnight. all of this can be compared to the southern english whose kindreds began to drift apart in the 900s and where feuding seems to have disappeared by the 1100s. remember that the law of wihtred in kent outlawed cousin marriage sixty years (two generations) before the franks did. also keep in mind that there may be regional differences in france (as in britain) that might be obscuring an earlier disappearance of kindreds/clannishness in “core” france. or maybe not. we shall see.